Borrowed from Phil, on the recommendation (his and USA Today’s) that “If you only read one Western, read this one”, I started this weighty tome a few weeks before flying out to Nepal. I found Lonesome Dove a slow start, and although it accompanied me all the way to Tsum and around the Manaslu Circuit, it remained largely unread during the trek, partly due to lack of opportunity and partly due to lack of inclination. However, once back in London I reached the stage where retired Texas Rangers, Captains Call and McCrae, are ready to leave Texas, leading their crew of cowboys on an epic cattle drive from the heat of the Mexican border, north across the plains and the rivers that run down from the Rockies, to the blizzards and mountains of Montana. Cowboys and Rangers. Young settlers and old trappers. Indians and outlaws. Cows and buffalo. Grizzlies and rattlesnakes. Happiness and sadness. 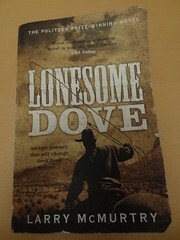 Lonesome Dove turned out to be a very good read.